Sources of clinical treatment information on nonhuman primates are generally scattered across journals, textbooks, conferences, personal conversations, and more. However, when a clinician on the treatment floor is faced with a patient requiring an immediate treatment decision, time spent on making an informed decision becomes a critical factor. An alternative to conducting a literature search in time-sensitive situations, the Pocket Handbook of Nonhuman Primate Clinical Medicine supplies guidance and initial direction on diagnosis and treatment, including working doses based on past case experience. It is the frank, to-the-point nature of the writing that makes readers feel as if they had just asked a colleague how to approach a clinical problem and obtained a quick, "what you need to know" answer. The chapter authors draw on personal experience to describe commonly encountered clinical conditions and how to treat these cases�including not only the "dos" but also the "don�ts." This format gives readers easy access to clinical signs, diagnostic criteria, and options for treatment. 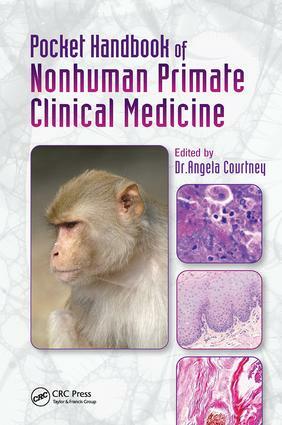 The Pocket Handbook of Nonhuman Primate Clinical Medicine is a convenient, concise, case-based handbook written by and for clinicians in charge of the diagnosis and treatment of nonhuman primate patients. Available in both print and electronic formats, this handbook saves readers from having to wade through pages of data and case studies to find answers when time is a factor on the clinic floor.